For Asian Americans, two issues always give us the moral high ground: the WWII incarceration of Japanese Americans and the fight over equity pay for Filipino American veterans of WWII. But just because you have the moral high ground doesn’t mean you are guaranteed victory. That’s been true for the Filipino veterans, thousands of whom are still fighting for pay equity. In that sense, it’s like the war never ended for Celestino Almeda, 98, of Maryland, and a proud Filipino American World War II veteran. On Veterans Day, he stood out in the cold at Lafayette Park, right in front of the White House gate, to read aloud his protest letter to anyone who would listen. You see, the president signed something in 2009 called the American Recovery and Reinvestment Act. That was the official name for the so-called “stimulus” package. Like a big turkey, it’s stuffed with goodies for politicos and constituents. Intended to stimulate the economy, it also finally ends a major issue for Filipino veterans of WWII. Tucked deep within the bill was the Filipino Veterans Equity Compensation Act–the very law that gave the vets a $15,000 lump sum if they were in the U.S.; $9,000 if they were in the Philippines. How are they doing six years later? 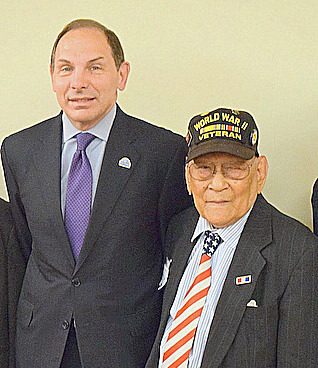 It amounts to a payout of over $224 million awarded to eligible Filipino Veterans. Before you jump for joy, go over the numbers again. Of the 42,755 applications, more than 23,804 have been disapproved. That’s a 56 percent disapproval rate. In other words, if you’re a Filipino vet of WWII looking for your lump sum, or think you have a claim, just flip a coin. It’s better odds than Keno, but with Keno, you might get lucky and win a whole lot more. That’s what it’s been like for the vets the last six years. Many of the 23,804 were denied because they truly were ineligible. You must be a surviving spouse or widow. No kids. But the biggest fixable issue is whether you are a verifiable vet, with legit documents from both the Philippines and the U.S.
It’s tougher than you think, considering how documents in the Philippines were lost during the Japanese occupation. Given all that, of the more than 23,804 denials, more than 4,500 have appealed their rejection. Of those, 1,253 have been denied again as of August. For those folks, that’s it–end of the road. War over. Game over. Many could have used the money and die as paupers. But that leaves about 3,000 veterans still in the process of being vetted by the VA. Still hopeful. Still alive. One of them is Almeda. Almeda knows about the broken promise of Roosevelt that brought him as a member of the Philippine Commonwealth Army to fight side-by-side with the U.S. Army. He’s got pay stubs and a formal discharge to prove it. His documents are good enough to be made whole on some of the FDR promises broken when President Truman signed the Rescission Act of 1946. Almeda was granted citizenship in the ’90s, and in 2003, began getting VA medical benefits. He has a VA card to prove it. But none of that has been good enough so far the VA to approve him for the lump sum payment. When I talked to him last year, Almeda had testified in Washington, D.C. before a Congressional subcommittee. There’s no doubt in his mind he served. This year in June, Almeda met with Sec. Robert McDonald of the VA and even posed with the secretary for a picture. Almeda said McDonald promised to get back to him. So far, Almeda has heard nothing. That’s why Almeda was out in front of the White House protesting the inaction of the VA. But something has also happened since Almeda’s June meeting. The U.S. Court of Veterans Appeals has determined in at least one case that the VA secretary does have the right to use his “discretion” on the evidence provided by veterans like Almeda. In a memo to the VA, veterans advocate Eric Lachica asked for clarification on the discretion that Secretary McDonald may have in deciding which documents will make veterans eligible. Almeda’s case may be the one that could resolve the document snafu that has stymied thousands who are appealing denials. VA Secretary McDonald should use discretion at least in Almeda’s case. Accepting his documents, granting him the one-time lump sum payment wouldn’t just be the right thing. It would be the humane and honorable thing to do. Almeda has made it his mission most of his adult life to be made whole after the Rescission Act. He is now the latest of the dwindling number of vets to lead the charge for Filipino Americans, for Asian America, at the forefront of the high road. At age 98, time used to be on his side. But for how much longer?